Looking for local honey? 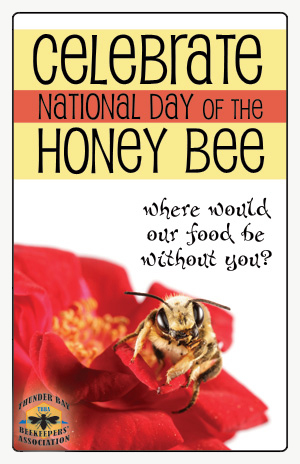 Email the Association and we'll send you a list of beekeepers who have honey available. From time to time, the Thunder Bay Beekeepers' Association participates in events of interest to Beekeepers. Here is a list of upcoming events in the area. Is your honey the best? Join us at the fair for an old-fashioned competition! A project based on any one type of agriculture eg: beekeeping. May be a chart, diagram, free standing, etc. Not to exceed 60 cm. Please refer to the Hymers Fall Fair Prize list available in print or online( www.hymersfair.com) for a full description and the rules for competing. Thunder Bay Beekeepers' Association is pleased to partner with Roots to Harvest to offer this years Introductory to Beekeeping Course with content from the Ontario Beekeepers Association. Please join us May 26 and 27th. Registration includes membership to TBBA for 2018. Join us at 6:30 for social time. The Legion kitchen & bar will be open. 7 pm: The Annual meeting and election of officers. why do well-mated queens produce the busiest bees? It's Ontario Varroa Mite Awareness Week - Please Count Your Mites! As you know, varroa mites are harmful, and even destructive to bees and their colonies and need to be monitored closely. This is an important time to ensure your bees are healthy going into winter. OBA has a survey (link below) and also a great video series. From now until September 16th, the Ontario Animal Health Network (OAHN) is asking ALL beekeepers in Ontario (commercial, small-scale, anywhere in between) to check varroa mite levels in their colonies AND report their results anonymously using the survey found in the link below. This is a very exciting project to be part of, as it will allow us to map varroa mite loads across the province by county. These results will posted by the end of September. Keep in mind that these data are secure, and OAHN will NOT publish your name, beeyard addresses, or any other identifying information. To maintain the privacy and security of your beeyard locations, we will be mapping data on a county level only. Anyone who participates in the survey will be entered to win awesome beekeeping prizes from the Ontario Beekeepers' Association and our sponsors, Apihex and Propolis. Jump right to the survey to report your varroa levels. The OAHN Bee Expert Network is comprised of specialists, producers, researchers and veterinarians from private industry, University of Guelph, York University, Niagara College, the Ontario Beekeepers' Association, and the Ontario Ministry of Agriculture, Food and Rural Affairs. Visit the Ontario Animal Health Network's website for more information about the Bee Expert Network and its members. More information about OAHN's Mite Awareness campaign can be found here. TBBA recommends a formal cycle for the use of synthetic miticides (only when required). As such, Apistan will be recommended on ODD years and Apivar on EVEN years. This is to prevent resistance when synthetic, approved miticides are required, over an above usual organic treatments such as thymol, formic acid, MiteAway Quick Strips, and oxalic acid. This will be re-visited as information is reviewed and with updates from the Ontario Bee Association. Thinking about getting started in beekeeping? The following links from the Ontario Beekeeping Association may provide some useful information. Where do I buy bees? — refer to the classified tab on this website! Buy local bees and protect our area from Varroa mite infestation. Membership application form is available for download. If you are considering bees as a hobby or as a sideline business, there are things you will want to keep in mind before making that decision. Since there are many factors involved with making money with the honeybees produce, you might want to start doing it as a hobby. There is a significant amount of money in the start-up of beekeeping. Before investing any amount of money in your beekeeping project, you might want contact beekeepers in your area. As a rule, they will more than happy to share their experience with you. Most beekeepers love keeping bees and to them it is just a "hobby", but they can give you some insight into beekeeping. Take plenty of notes. More likely than not you will need them. Consider joining the Thunder Bay Beekeepers' Association and participating in the Association facebook group — both avenues will give you access to experienced beekeepers who are willing to chare their knowledge. the safety of family, friends, and neighbors. You wouldn't want someone who is allergic to bee stings to get stung! The best course of action on that account is to ask your neighbors and friends, if any of them are allergic to bees. finding out if there might be someone who would not like beehives so close to their proximity. Checking with the municipality you live in. You will want to know about any ordinances or laws prohibiting beekeeping. whether or not you have a location that would be conducive to maintaining bees. where the bees will have to fly to retrieve nectar and pollen. Keeping plants they like close by is not a bad idea either. That bees need water every day. You might want to have water for them close at hand. You don't want them visiting the neighbor's swimming pool! What will be underneath the bees as they fly to get the nectar and pollen they require. The bees will defecate as they are flying and their feces will leave spots on everything below them. The feces can even ruin the surface of a vehicle. There are methods to use to force the bees to fly at a higher altitude, such as a tall fence or thick tall plants near the hive. Accessibility -- You want the hives accessible year round. You will want to avoid low spots for your hives because they hold the cold, damp air too long. You will also want to avoid high spots for your hives because that would be too windy. Keep a constant warm water supply for the bees to cool the hive and dilute honey to feed their young. They will collect water from the closest water source. If you do not have a constant supply of shallow water for the bees, they will look for it somewhere else, like the neighbor's pool, birdbath or wading ponds. The bees are more likely to drown in those sources. If you have a water supply for them when they first fly out in spring, they will not go anywhere else for water. Once they find a water source, it is hard to keep them from going back to it. A beekeeper must keep the bees in control every time the hive is open. A typical hive can house thousands of workers all capable of stinging. There are measures a beekeeper can take in the open that he can not take in the city because of the closeness of other people. Smoke is the most important tool for the beekeeper opening a hive. Smoke should be used in moderation, but the smoker should be capable of producing large volumes of smoke on short notice. The beekeeper must smoke the entrance of the hive, under the cover, and periodically smoke the frames while the hive is open. Try not to jar the hive or the frames as that may anger the bees, which will make it hard for a beekeeper to do his work. The beekeeper must work quickly and carefully. By going through the frames several times a year, the beekeeper keeps the frames movable. Remove any excess combs. Using gloves when working with bees make the beekeeper clumsier and he may lose control of the hive. The stings that the gloves are protecting you from are easily removed and the pain quickly passes. These are just some of the tips you will want to consider before taking on this hobby. Join us on facebook and get to know first about our events, news and outings. This is where the beekeeping discussions are happening between meetings! Read the latest buzz - enjoy! Many files on this website are in the PDF format and require Adobe Reader to open. To get the free Adobe Reader, click the image below to be redirected to the Adobe Reader download page.